Triumph, victory, hope, memory, digestion, violence in maintaining traditional ideas, the "die-hard", ruthlessness, lust of destruction, obedience, faithfulness, authority under authority. It is the sign of the Crab, Cancer. It is Khephra, the beetle-headed God, representing the midnight Sun. In the ancient Egyptian astrological philosophy, Cancer was to be the Celestial House of the Soul. Mercury in his aspect of the messenger of the Gods, and Apollo in his role of the Charioteer, are other attributions. The Norse correspondence is Hermod, the envoy of the Gods, the son of Odin, who gave him a helmet and corselet which Hermod wore when despatched on his dangerous missions. Unfortunately, the Hindu gods are not sufficiently determinate to enable one to make an attribution from their number with any degree of satisfaction, unless we decide upon Krishna in his role of driving the chariot of Arjuna to the battle of Kurukshetra, as described in the Mahabharata. 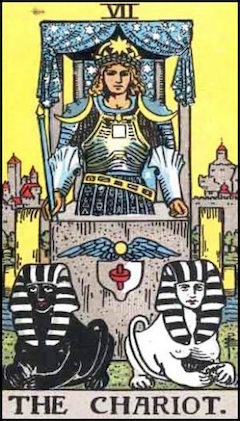 The Tarot card is a most interesting one, VIl -The Chariot. It denotes a chariot, the canopy of which is blue and decked with stars (representing Nuit, the night sky- blue, Space, and our Lady of the Stars). In the chariot is a crowned and armoured figure, on whose forehead glitters a Silver Star-the symbol of spiritual rebirth. On his shoulders are mounted two crescents, the waxing and waning Moon. Drawing the chariot are two sphinxes, one white, the other black, representing the conflicting forces in his being which he has mastered. 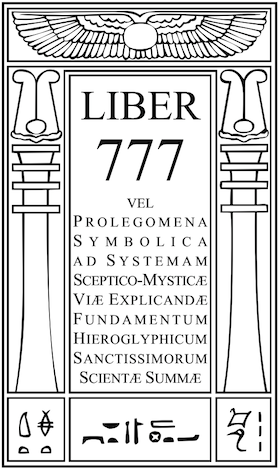 On the front of the chariot is a glyph of the lingam, his regenerated or sublimated "Id" or libido, surmounted by the winged globe, his transcendental Ego with whom he has become united. The whole card adequately symbolizes the Great Work, that process by which a man comes to know the unknown Crown, and attains to the Knowledge and Conversation of his Holy Guardian Angel, perfect self-integration and consciousness. A word apropos the libido. In this term Jung saw a concept of an unknown nature, comparable to Henri Bergson's elan vital, a hypothetical energy of life, which occupies itself not alone in sexuality but in various other physiological spiritual manifestations. Bergson speaks of this elan vital as a movement of self-creation, a becoming, and as the very stuff and reality of our being. Its sacred animal is the Sphinx, whose expression of enigma combining male, female, and animal qualities is an apt symbol of the Great Work brought to perfection. The Sepher Yetsirah names Cheth "The House of Influence" ; the Lotus is its flower, Onycha its perfume, Maroon its colour, and Amber its jewel. A beautiful woman wreathed with myrtle. She holds a lyre and sings of love and gladness. Probably a centaur or archer. Leapard’s head and gryphon’s wings. Cruel ancient, with long white hair and beard, rides a pale horse, with sharp weapons. The Child of the Powers of the Waters: the Lord of the Triumph of Light.